Craft Becomes Modern: The Bauhaus in the Making looks at the Bauhaus from the perspective of this noisy activity?handcraft. No term was more fiercely disputed there. Although conceived as “laboratories for industry,” a great deal was still done by hand in the Dessau workshops. Workshops at the Bauhaus straddled the different priorities and practical realities at play, falling somewhere between factory and craft business, between free experimentation and industrial contract work. From this field of tension, the Bauhaus tried to define handcraft anew as a utopian pursuit that could coexist with industrial culture. The Bauhaus’ interest in industrialization has been thoroughly studied; the persistence of craft among its teachers and students much less so. 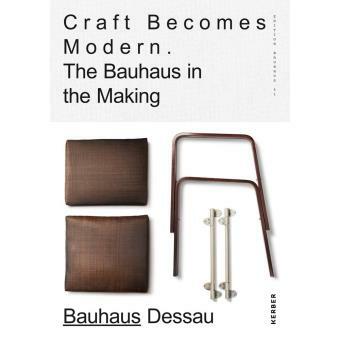 Craft Becomes Modern surveys this aspect of the Bauhaus’ teaching and work, and puts it in historical context. And these debates are far from over?this volume includes contributions from a range of contemporary design theorists and practitioners, including Julia Bryan-Wilson, Martino Gamper, John Maciuika, Rafael Cardoso, Joseph Grima, Gerda Breuer, T’ai Smith, Eva Forgacs and Sara Ouhadou, offering new insights for understanding handcraft in the 21st century.